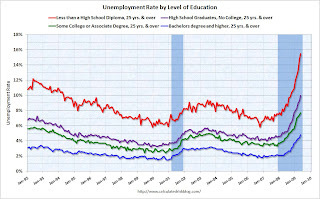 This graph shows the unemployment rate by four level of education. Note that the unemployment rate has risen sharply for all categories in 2009. For "less than a high school diploma" the rate has increased from 9% in 2009 to almost 16% in May.